Generics and Biosimilars Initiative Journal (GaBI Journal). 2018;7(1):14-21. Background and aim: Biosimilar medicines are not considered exact replicas of originator biological medicines. As a result, prescribers can be hesitant to introduce such medicines into the clinical setting until evidence surfaces confirming their safety and effectiveness. In Ireland, a national biosimilar medicines policy is currently in development but the decision to prescribe biosimilar medicines remains at the discretion of the physician. The aim of this descriptive review is to tell the story of the evidence used by a large acute Irish teaching hospital to introduce biosimilar infliximab CT-P13 for the treatment of inflammatory bowel disease (IBD) in a safe and timely manner into routine care. Methods: To explore the evidence supporting the effective introduction of biosimilar infliximab in a large acute Irish teaching hospital, a literature review was conducted. Evidence consisted of published studies, reviews, reports, position statements, articles, clinical guidelines, and recommendations from national bodies, regulatory authorities and professional organizations. All evidence was published in English. Results and discussion: In September 2014, the accumulated evidence base provided physicians with reassurance to prescribe biosimilar infliximab CT-P13 for new patients suffering from IBD in this large acute Irish teaching hospital. In September 2016, as the evidence base grew, physicians began to safely and confidently switch patients from the originator infliximab product to the biosimilar product. Conclusion: There was a significant time lag between regulatory approval and clinical acceptance given that the European Medicines Agency had granted market authorization for biosimilar infliximab CT-P13 three years prior to the initiation of this hospital’s switching process. Although conservative in their execution, the authors conclude that with the existential concern and uncertainty still surrounding biosimilar medicines, a distinct and individualized approach for biosimilar medicine implementation is required. It is with hope that the Irish biosimilar medicines policy will improve upon biosimilar medicine clinical acceptance once published. In 2014, six of the top 10 blockbuster medicines were monoclonal antibodies . In recent times, small molecule chemical entity (SMCE) blockbuster drugs like Viagra® and Lipitor®, have been superseded by blockbuster biologicals such as Humira® and Enbrel®, demonstrating the newly acquired prominence of biological medicines [2, 3]. However, these large complex proteins (comprised of or derived from living cells or organisms) are more complicated than traditional SMCEs due to their unique manufacturing process . Unlike generic drugs of SMCEs, biosimilar medicinal products (biosimilars) which aim to replicate originator biological products, have given rise to concerns related to their pharmaceutical quality, safety (especially immunogenicity) and efficacy (particularly in extrapolated indications) [5, 6]. This can create confusion around the practice of interchangeability which is not as lucid for biosimilars as it is for generic drugs of SMCEs . Substitution, switching and interchangeability are terms often used when discussing biosimilars. Pharmacists can substitute generic drugs of SMCEs in Ireland and the UK on the proviso these medicines are deemed interchangeable [7–9]. The European Medicines Agency (EMA) defines substitution as ‘the practice of dispensing one medicine instead of another equivalent and interchangeable medicine at pharmacy level without consulting the prescriber’ whilst interchangeability refers to ‘the possibility of exchanging one medicine for another medicine that is expected to have the same clinical effect’ . However, pharmacist substitution of biosimilars is not currently permitted in most countries [4, 11], although pharmacists practising in Australia can substitute some biological medicines . In the majority of cases, it appears that pharmacists are bound by legislative constraints at the point of dispensing . As a result, physicians are the key stakeholders to switch patients to and from different brands of the same or similar biological medicines, where switching is defined as ‘when the prescriber decides to exchange one medicine for another medicine with the same therapeutic intent’ . There is no longer a dearth of evidence when it comes to the science and interchangeability status of biosimilar medicines. However, knowing when it is most appropriate and timely to implement these medicines into routine clinical practice can be difficult. In a large acute Irish teaching hospital, biosimilar infliximab CT-P13 was introduced in place of originator brand infliximab (Remicade®), to treat inflammatory bowel disease (IBD). As well as Crohn’s disease (CD) and ulcerative colitis (UC), Remicade® is licensed to treat a range of other autoimmune diseases such as rheumatoid arthritis, ankylosing spondylitis, psoriatic arthritis and psoriasis . In the absence of a national Irish biosimilar medicines policy and with perceived uncertainty surrounding biosimilar medicines, this descriptive review adds to the literature by illustrating the independent systematic evidence base behind the decision-making process to introduce biosimilar infliximab CT-P13 into secondary care treatment of IBD. In June 2013, biosimilar infliximab was licensed by EMA . The agency’s Committee for Medicinal Products for Human Use (CHMP) recommended the granting of marketing authorizations for the first two monoclonal antibody biosimilars, Remsima® and Inflectra®, both of which contain the same known active substance infliximab CT-P13. The decision to provide marketing authorization for both these infliximab biosimilar medicines was based on the same documentation. Their application dossiers demonstrated parallel similarity to the biological medicine Remicade®, which has been authorized in the European Union (EU) since 1999 . Remsima® and Inflectra® are recommended for authorization in the same indications as Remicade®. A few weeks after biosimilar infliximab CT-P13 was licensed, the European Crohn’s and Colitis Organisation (ECCO) released a position statement. In it, they articulated that post-marketing pharmacovigilance and unequivocal identification of infliximab CT-P13 as a biosimilar was in place. However, their overall stance on the issue was that the use of most biosimilars in patients with IBD should require testing in this particular patient population with comparison to the appropriate innovator product (Remicade®) before approval . ECCO also considered the benefits of wider access with appropriate use of biological therapy in IBD and potential direct cost savings important but its primary concern was that rigorous testing was necessary in patients with IBD to ensure that appropriate efficacy and safety standards were met. The organization was of the opinion that final clinical decisions should always be made on an individual basis, taking into account both the circumstances of the individual patient and the prescribing physician. ECCO defied the practice of extrapolation for biosimilar infliximab at this time. In addition to stance taken by ECCO, several national physician societies initially questioned the marketing authorizations of biosimilars, including the extrapolation to IBD. Retrospectively, it became obvious that there was a lack of understanding of the biosimilar development concept . Contrary to the guidance from ECCO, the chief pharmacist and consultant gastroenterologist of a large acute Irish teaching hospital decided to introduce biosimilar infliximab CT-P13 for use in new patients in September 2014. Both parties had been documenting the evidence trail since the licensing of this biosimilar in June 2013 and believed there was enough accumulated evidence from various sources to support their decision [15, 18]. This information was relayed to all prescribing physicians during an internal staff meeting where the chief pharmacist and consultant gastroenterologist explained the science behind their evidence-based decision. All physicians accepted this decision and agreed to prescribe biosimilar infliximab CT-P13 for new patients. Physicians agreed to report any adverse drug reactions (ADRs) to the Health Products Regulatory Authority (HPRA) in Ireland and to EMA. Hospital budget coordinators were pleased given that the biosimilar product was cheaper than the originator brand. With verbal reassurance to patients on the safety and efficacy at the point of prescribing, physicians faced no opposition from new patients. Although this new prescribing practice could have been deemed hasty, the British Society of Gastroenterology (BSG) released a position statement with updated guidance two months later justifying the introduction of biosimilar infliximab CT-P13 in the clinical setting. The BSG recommended that infliximab should be prescribed by brand name . This prescribing practice contradicts the trend for SMCE medicines where prescribing generically is encouraged . This statement also proposed the use of a prospective registry of all biological use in IBD patients to capture safety data and side effects. For patients already on therapy, it was recommended to avoid switching from the originator product to the biosimilar, or vice versa, at least until safety data was made available . During the summer of 2015, the National Institute for Health and Care Excellence (NICE) remarked positively on the topic of biosimilar prescribing. Their report concluded that EMA was content that the pharmacokinetics, efficacy, safety and immunogenicity profiles of biosimilars were similar to those of the originator product and concluded that the recommendations for infliximab could apply both to the originator product and its biosimilars . In addition, the HPRA released a guide to biosimilars for healthcare professionals (HCPs) and patients in December 2015. This guide discussed the concept of extrapolation in the context of biosimilars where a clinical study is carried out in one of the approved indications of the biological medicine and the efficacy data are then extrapolated to all authorized indications . As stated in this guide, extrapolation is not unique to the authorization of biosimilars; a similar approach may also be used to deal with post-authorization changes for reference biological medicines. In February 2016, both NICE and the BSG updated their previous guidance on this subject. NICE reinforced that all HCPs should ensure biological medicines, including biosimilar medicines, are prescribed by brand name so that products cannot be automatically substituted at the point of dispensing. The choice of whether a patient receives a biosimilar or originator biological medicine should rest with the clinician in consultation with the patient . The BSG however decided to go one step further, releasing a position statement on infliximab brand switching. Their guidance stated that there was sufficient evidence to recommend that patients who were in stable clinical response or remission on Remicade® therapy can be switched on the same dose and dose interval to biosimilar infliximab CT-P13. This switch should be carried out after discussion with individual patients with an accompanying explanation for switching (which is usually on the grounds of benefit to the overall service by reduction in costs of the drug and its administration) . Despite the position statement from the BSG, this large acute Irish teaching hospital judged that it was premature to switch all of its patients from Remicade® to biosimilar infliximab CT-P13. Two months later, a review entitled ‘Switching to biosimilar infliximab (CT-P13): evidence of clinical safety, effectiveness and impact on public health’ published in Biologicals concluded that whilst prudent switching practices should be employed, growing safety experience accumulated thus far with infliximab CT-P13 and other biosimilars was favourable and did not raise any specific concerns . Similar evidence that was in favour of switching had also started to surface [19, 22]. In June 2016, ScienceDaily published a research article on their website entitled ‘Biosimilar switching not suitable for all patients’ . At first, it appeared to the consultant gastroenterologist and chief pharmacist that this article, based on a study conducted in Spain , would counteract previous evidence in favour of switching. However, when examined closely, the results of the study showed that when anti-drug antibodies develop in response to Remicade®, these antibodies also cross-react with biosimilar infliximab CT-P13 as both biologicals share structural properties, including antigenic epitopes. These findings suggested that antibody-positive patients being treated with Remicade® should not be switched to biosimilar infliximab CT-P13 since these antibodies would also interact with the biosimilar and potentially lead to a loss of response. Despite its misleading title, the results of this research article actually emphasized the similarities between the originator and biosimilar brands of infliximab and reinforced the science behind the safety of switching. In fact, it should be reinforced that anti-drug antibodies prevent a switch only if the exposure or clinical effect of the reference product is fading. July 2016 saw the European Commission (EC) release guidance stating that biosimilars, despite small differences, were expected to be as safe and effective as the reference medicine . This publication followed previous documentation issued by the EC in 2014 explaining the concept of biosimilars to HCPs and the pharmaceutical industry . Therefore, based on all the continually emerging evidence in favour of switching, the chief pharmacist and consultant gastroenterologist of the large acute Irish teaching hospital decided to switch all its patients from originator brand infliximab to biosimilar infliximab CT-P13 commencing in September 2016. This decision was relayed to all prescribing physicians during an internal staff meeting where the chief pharmacist and consultant gastroenterologist explained the science behind their evidence-based decision. All physicians accepted this and agreed to switch patients given the vast amount of evidence presented. Physicians agreed to report any ADRs to the HPRA and to EMA. Hospital budget coordinators were once again pleased. Although physicians found it more challenging to reassure patients of the switch at first, they reported that after informing and addressing all patient concerns at the point of prescribing, no opposition to switching arose. In October 2016, explorative subgroup analyses of patients with CD and UC in the NOR-SWITCH study showed similarity between patients treated with originator infliximab and biosimilar infliximab CT-P13 with regard to efficacy, safety and immunogenicity . Although this was one of the more large-scale controlled studies where biosimilar infliximab CT-P13 was tested in IBD patients, the small sample size of the IBD subgroup was too small to demonstrate any difference in ADR identification or minor differences in effect . However, it was still an advancement on previous evidence for switching which was more so justified on the concept of extrapolation. ECCO released an updated statement in December 2016 that revised its previous guidelines. One of the prominent recommendations was that switching IBD patients from the originator brand to a biosimilar product was now deemed acceptable. It also stated that studies of switching can provide valuable evidence for safety and efficacy and that scientific and clinical evidence is lacking regarding reverse switching, multiple switching, and cross-switching among biosimilars in IBD patients . In this rapidly moving field, the evidence is continuing to grow supporting the case that biosimilar infliximab CT-P13 is just as safe and effective as the originator biological. Figure 1 illustrates in diagrammatic form, the systematic trail of evidence behind the decision-making process to introduce and switch patients to biosimilar infliximab CT-P13 in this large acute Irish teaching hospital. The decision to treat new and switch existing patients to biosimilar infliximab CT-P13 in this large acute Irish teaching hospital was a multifactorial one underpinned by a robust and extensive evidence-based trail that ultimately convinced prescribing physicians. From September 2014, all new patients requiring infliximab therapy for the treatment of IBD were prescribed biosimilar infliximab CT-P13. In September 2016, all IBD patients receiving Remicade® were switched to biosimilar infliximab CT-P13. Switching from originator infliximab to biosimilar infliximab CT-P13 in IBD patients occurred in this hospital before any other Irish hospital and before the release of the NOR-SWITCH study data. Biosimilar infliximab CT-P13 was first licensed in June 2013  but it was not until approximately three years later that prescribers in this large acute Irish teaching hospital decided to switch patients. It is evident that there was a significant time lag between regulatory approval and clinical acceptance. In fact, Ireland has the second lowest record of biosimilar use due to Irish HCPs being slow to accept biosimilars [29, 30]. This is possibly owing to a lack of confidence, unwillingness or knowledge to prescribe biosimilars which is also seen in other European countries . Work which aims to enhance the understanding of biosimilar medicines amongst stakeholders and to encourage best practice of biosimilar use is currently being conducted by a collaborative organization of various interested parties [32, 33]. However, it could be argued that Ireland has exceptionally low biosimilar uptake because biosimilar prescribing is not mandated unlike in other countries . In addition, the Irish biosimilar market does not appear very appealing to pharmaceutical companies. Despite the potentially huge cost savings to be made from switching, only 54 packets of the biosimilar product Benepali® were sold since its introduction to Ireland in August 2016 compared to almost 46,856 of the established originator brand Enbrel® (as of May 2017) . Furthermore, various funding systems of different countries can too have an impact where, for example, in the UK, a major motivation for switching was reinvestment of some of the cost savings in improvements to patients’ care . The decision by this Irish teaching hospital to switch patients to biosimilar infliximab could have been regarded as over cautious, delayed and conservative given that EMA had already licensed the biosimilar medicine three years earlier  and thus, one wonders why prescribers had not switched patients sooner. With regard to the current biosimilar medicine landscape, it is possible that prescribers may feel more comfortable issuing biosimilars if national authorities would actively enforce and implement individual EMA biosimilar-related decisions as they are published. EMA has the best knowledge of biosimilars amongst regulators but cannot influence interchangeability that is within the mandate of individual national regulatory agencies . These authorities have different capacities to produce information on biosimilars and as a result, this situation contributes to the differential rate of acceptance of biosimilars within EU Member States. With continually emerging positive evidence, it is clear that a three-year time lag for the next biosimilar medicine, from market authorization to the patient switching process, should not occur. Flixabi®, biosimilar infliximab SB2 , received market authorization approximately three years after biosimilar inflixmab CT-P13 . Given its late entry to the market relative to biosimilar infliximab CT-P13, it has been unsuccessful in penetrating the Irish market so far. The chief pharmacist and consultant gastroenterologist of this teaching hospital note that they would not be comfortable in switching patients from biosimilar infliximab CT-P13 to biosimilar infliximab SB2 without conducting a comprehensive review of the available evidence, (especially evidence from a switching study), even if the national regulator did declare all licensed biosimilars completely interchangeable . Interestingly however, this large acute Irish teaching hospital was content to switch patients to Tevagrastim®, a biosimilar of filgrastim , from the originator brand without performing such a robust evidence review. With regard to the difference between these medicines and their respective disease states, the onset of response on neutrophil count from filgrastrim therapy occurs very quickly after administration and thus is routinely measured to ascertain treatment effectiveness. In contrast, there is no such clear-cut marker for assessing the onset of response from infliximab therapy at these very early stages so this is why an extensive evidence review was conducted prior to switching patients. The comparison between the implementation of these two biosimilars demonstrates that each biosimilar medicine requires a distinct and individualized approach when considering its introduction into the clinical setting; one approach does not suit all. In the field of gastroenterology, biosimilar adalimumab, which is licensed to treat IBD, was recently granted market authorization . In the Irish context to date, there have been no major efforts to introduce or switch patients to this biosimilar. However, adalimumab is predominantly dispensed by pharmacists in the primary care setting. This is in contrast to infliximab, which is commonly dispensed in the secondary care environment. This difference is quite interesting as it raises the issue that perhaps primary care pharmacists should be targeted by regulatory agencies to encourage patients to switch to biosimilar adalimumab in an effort to increase biosimilar medicine market penetration. However, as previously noted, this switch would have to be initiated by the prescribing physician  and be based upon appropriate evidence. Indeed, there are already many interesting and established approaches to biosimilar medicine implementation which demonstrate that just because a biosimilar medicine is licensed, does not mean that its use will be accepted by prescribers nor that all patients receiving the originator brand should be automatically switched. One such approach is whereby the American National Kidney Foundation sponsored a symposium entitled ‘Introduction of Biosimilar Therapeutics Into Nephrology Practice in the United States’ . With anticipated increase in biosimilar products in the field of nephrology, mutually accepted lack of knowledge regarding the biosimilar approval process and development, and lack of trust with respect to biosimilar medicines’ safety and efficacy, this community of experts decided to meet at a nationwide level to discuss the introduction of biosimilars into their area of medicine. The colloquium highlighted several controversies but also made recommendations related to public policy, professional and patient education, and research needs . With the introduction of new biosimilars set to increase on the market in coming years , this example of individual fields of medicine taking responsibility for biosimilar usage pertaining to their area may be a safe, feasible and effective approach to introduce biosimilars into the clinical setting. This strategy might be particularly suitable for fields like oncology and other inflammatory diseases where biosimilar usage is set to increase substantially [42, 43]. Another possible approach is that original biological and biosimilar medicines can be prescribed on the proviso that patients will be entered into disease-specific registries. These registries may be used as surveillance systems for monitoring ADRs, as well as to quantify and evaluate the risk-benefit ratio throughout a medicinal product’s life. Registries may be particularly effective for the evaluation of rare ADRs occurring in the real-world population of treated patients, as opposed to the highly selected populations in registration studies . Following on from information released by the Medicine Management Programme (MMP) on biosimilars in the Irish healthcare setting in 2016 , and guidance issued by the National Cancer Control Programme (NCCP) on the use of biosimilar medicines in oncology in August 2017 , the Department of Health (DoH) disseminated a consultation paper in mid-August 2017 . This paper indicates that the DoH is developing a national biosimilar medicines policy which aims to increase biosimilar use in Ireland by creating a robust framework where biologicals and biosimilars can be safely, cost-effectively and confidently used in the health service . Table 1 reveals which topics of interest are being scrutinized. It is hoped this policy will address the inter-hospital variation to biosimilar medicine implementation in Ireland and shorten the acceptance process of using biosimilars in the clinical setting. An interesting issue raised by the consultation paper is that of inappropriate business practices . Although this was not of concern for this large acute Irish teaching hospital, impact of the source of information and collaboration of prescribers with the pharmaceutical industry can in principle, have an influence on originator product and biosimilar product prescribing patterns. The consultation paper highlights that France and Germany have laws banning physicians from receiving gifts from pharmaceutical companies. For biosimilar medicine uptake to increase and be maintained, the information and evidence used by prescribers must not be tainted with commercial interests. One of the consultation paper’s recurring themes is that there is too much money being spent on originator biologicals when there are cheaper, equally effective alternatives available. It highlights that only 11 biosimilars are currently reimbursable by the Irish healthcare system, while over Euros 200 million is spent each year on biological drugs that already have approved biosimilars or that will have available biosimilars throughout 2018 . It is clear that the potential cost savings to be accrued from switching to biosimilars can increase patient access to other new medicinal products. The Irish Pharmaceutical Healthcare Association (IPHA) framework agreement plans to save money on biological medicines [30, 47] where most of these medicines are reimbursed on Ireland’s high-tech medicine scheme. This scheme has seen an increase in expenditure from Euros 177.49 million in 2005 to Euros 562.29 million in 2015 [48, 49]. This prodigious level of pharmaceutical expenditure cannot be maintained. Research from the Irish National Centre for Pharmacoeconomics (NCPE) has shown that when pharmaceutical companies submit budget impact analyses (BIAs) for new high-cost medicines such as biologicals, the majority of these high-cost medicines have a greater cost burden on the budget than what is forecasted in their BIAs [50, 51]. This results in taxpayers spending more than anticipated. Thus, an increase in the uptake of biosimilar medicines would be a more sustainable approach to lower the Irish drug bill. One approach the DoH could take would be to establish gainsharing agreements at hospital level. Hospitals could be financially awarded for using biosimilars  or fiscally penalized for lack of utilization. Gainsharing agreements have already proven to be a powerful incentive in increasing biosimilar use at EU level . With respect to the Danish biosimilar landscape, their initial passive approach to switching actually led to an administrative order . Thus, another approach the DoH could adopt would be to introduce reference pricing of biological products which would accelerate the path to increased biosimilar usage . Reference pricing of SMCE medicines has already resulted in savings of millions of euro in the Irish primary care setting . Success of the use of biosimilar infliximab CT-P13 at University Hospital Southampton [53, 54] and in Denmark and Norway was observed, where biosimilar infliximab reached market penetration levels in excess of 90% (as of April 2016) . Such uptake resulted in substantial drug acquisition cost savings and subsequently increased patient access to the biosimilar medicine [22, 53]. A recent report by QuintilesIMS™ has shown that the entrance of biosimilars into the market increases price competition while also generating price reductions for both biosimilar and reference products . However, this report stresses that if the problem of low biosimilar uptake is not appropriately managed in the long term, this could lead to fewer new biosimilars being developed, reducing overall competitive pressure. This review examines the evidence used by a large acute Irish teaching hospital to safely and effectively introduce biosimilar infliximab CT-P13 into the gastroenterology care pathway. There was a significant time lag between regulatory approval and clinical acceptance notwithstanding that EMA had granted market authorization for biosimilar infliximab CT-P13 three years prior to the initiation of this hospital’s switching process. However, the conservative approach to biosimilar infliximab implementation discussed in the review is justified given the conflicting and changing evidence disseminated from various sources over this three-year period. Alternative approaches that could be used to increase biosimilar medicine adoption into healthcare environments have been suggested. Undisputedly, this review demonstrates that increased biosimilar medicine usage is of benefit to all stakeholders: increased access for patients, more treatment options for prescribers, sustainable healthcare budgets for payers and more business opportunities for manufacturers. This research was funded by the Irish Research Council GOIPG/2016/635. Competing interests: The authors declare no competing interests in preparing this manuscript. 1. Moorkens E, Jonker-Exler C, Huys I, Declerck P, Simoens S, Vulto AG. Overcoming barriers to the market access of biosimilars in the European Union: the case of biosimilar monoclonal antibodies. Front Pharmacol. 2016;7:193. 2. Ziegelbauer K, Light DR. Monoclonal antibody therapeutics: leading companies to maximise sales and market share. J Commer Biotechnol. 2008;14(1):65-72. 3. Walsh G. Biopharmaceutical benchmarks. Nat Biotech. 2014;32(10):992-1000. 5. Weise M, Bielsky MC, De Smet K, Ehmann F, Ekman N, Giezen TJ, et al. Biosimilars: what clinicians should know. Blood. 2012;120(26):5111-7. 6. Weise M, Kurki P, Wolff-Holz E, Bielsky MC, Schneider CK. Biosimilars: the science of extrapolation. Blood. 2014;124(22):3191-6. 7. Dunne S, Shannon B, Dunne C, Cullen W. A review of the differences and similarities between generic drugs and their originator counterparts, including economic benefits associated with usage of generic medicines, using Ireland as a case study. BMC Pharmacol Toxicol. 2013;14 (1):1. 8. Duerden MG, Hughes DA. Generic and therapeutic substitutions in the UK: are they a good thing? Br J Clin Pharmacol. 2010;70(3):335-41. 9. Government of Ireland. Houses of the Oireachtas. Health (Pricing and Supply of Medical Goods) Act 2013. 16. Danese S, Gomollon F; Governing Board and Operational Board of ECCO. ECCO position statement: the use of biosimilar medicines in the treatment of inflammatory bowel disease. J Crohns Colitis. 2013;7(7):586-9. 18. McKeage K. A review of CT-P13: an infliximab biosimilar. BioDrugs. 2014;28(3):313-21. 21. Braun J, Kudrin A. Switching to biosimilar infliximab (CT-P13): evidence of clinical safety, effectiveness and impact on public health. Biologicals. 2016;44(4):257-66. 24. Ruiz-Argüello MB, Maguregui A, Ruiz del Agua A, Pascual-Salcedo D, Martínez-Feito A, Jurado T, et al. Antibodies to infliximab in Remicade-treated rheumatic patients show identical reactivity towards biosimilars. Ann Rheum Dis. 2016;75(9):1693-6. 27. Jørgensen KK, Olsen IC, Goll GL, Lorentzen M, Bolstad N, Haavardsholm EA, et al. Switching from originator infliximab to biosimilar CT-P13 compared with maintained treatment with originator infliximab (NOR-SWITCH): a 52-week, randomised, double-blind, non-inferiority trial. Lancet. 2017; 389(10086):2304-16. 28. Danese S, Fiorino G, Raine T, Ferrante M, Kemp K, Kierkus J, et al. 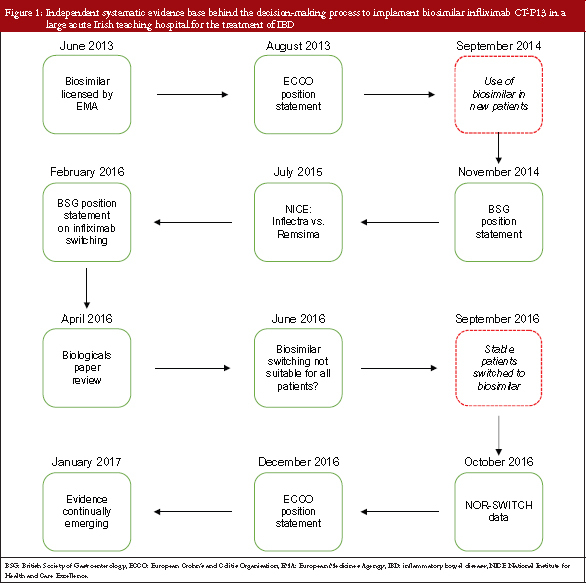 ECCO position statement on the use of biosimilars for inflammatory bowel disease-an update. J Crohns Colitis. 2017;11(1):26-34. 33. O’Callaghan J, Bermingham M, Leonard M, Hallinan F, Morris JM, Moore U, et al. Assessing awareness and attitudes of healthcare professionals on the use of biosimilar medicines: a survey of physicians and pharmacists in Ireland. Regul Toxicol Pharmacol. 2017;88:252-61. 40. Wish JB, Charytan C, Chertow GM, Kalantar-Zadeh K, Kliger AS, Rubin RJ, et al. Introduction of biosimilar therapeutics into nephrology practice in the United States: report of a scientific workshop sponsored by the National Kidney Foundation. Am J Kidney Dis. 2016;68(6):843-52. 42. Kim WS, Coiffier B, Kwon HC, Kim S. Clinical development of CT-P10 and other biosimilar cancer therapeutics. Future Oncol. 2017;13(15s):31-44. 43. Tesser JR, Furst DE, Jacobs I. Biosimilars and the extrapolation of indications for inflammatory conditions. Biologics. 2017;11:5-11. 44. Felwick R, Cummings JRF. CT-P13, a biosimilar of anti-tumour necrosis factor-alpha agent (infliximab), in inflammatory bowel diseases. Aliment Pharmacol Ther. 2017;45(10):1370-1. 47. Gorecki P. The savings from the 2016–2020 framework agreement on the supply and pricing of medicines in Ireland: Which counterfactual? MPRA Paper No. 79481. 2017. 50. Lucey S, Tilson L, Fogarty E, Walshe V, Barry M. A review of the quality and accuracy of budget impact models for high cost drugs in Ireland. Value Health. 2016;19(7):A458. 51. Fogarty E, Barry M. Predicted versus actual budget impact of high-cost drugs in Ireland. Value Health. 2014;17(7):A426-7. 53. Bettey M, Downey L, Underhill C, Callaghan J, Rush M, Ahmed I, et al. Outcomes of a managed switching programme changing IBD patients established on originator infliximab to biosimilar infliximab. J Crohns Colitis. 2017;11(6):690-6.